t the end, there was peace. As he lay dying, the man was free of the pain of his cancer and from not being able to eat anymore. His wife was calm. His children were by his side where his grandchildren were playing. All were making memories. It was at this moment, taking care of this man and his family, that Diana Wilkie, Ph.D., R.N., FAAN, knew death could be different. That helping people deal with pain could and should be different. That it wasn’t just about treating a person’s condition but also treating how they experienced it. Now an international expert in pain management and palliative care, Wilkie is leading a new interdisciplinary center at the University of Florida that aims to give this type of experience to any patient — human or animal — living with a serious or life-threatening illness. Everyone deserves not to just be treated for their health conditions, but to also have their symptoms and pain managed and to have their wishes respected, Wilkie said. Through the Center for Palliative Care Research & Education, Wilkie and colleagues across UF hope to transform care for people living with serious conditions, not only through research but also through training the next generation of palliative care providers and public education. End-of-life care and palliative care are often thought of as interchangeable terms, but palliative care actually focuses on helping people share what is important to them — their goals of care — and manage their symptoms, stress and the side effects of living with a serious condition. For one person, that might mean help managing chronic, unrelenting pain. For another, it might mean getting help with depression from being sick or wanting spiritual guidance. Although the availability of palliative care in hospitals across the country has grown in recent years — about 67 percent of hospitals have palliative care teams — as many as 1 million people still aren’t getting the care they need each year, according to a national report card produced by the Center to Advance Palliative Care and the National Palliative Care Research Center in 2015. By bringing together experts from a variety of disciplines across UF, the center aims to change statistics like these. And it starts with better science to not only validate the effectiveness of palliative care, but also discover new ways to offer people care. With 37 members — and counting — and close partnerships with UF Health’s palliative care team and the UF Health Cancer Center, the center is already home to projects that could improve care for patients. In September 2016, Wilkie and two other co-principal investigators at Northwestern University and Rush University Medical Center received a $3 million grant from the National Cancer Institute and the National Institute of Nursing Research to study dignity therapy at six sites in the U.S. The study seeks to find out who should lead this therapy, nurses or chaplains, and will also examine what role dignity therapy has on patient outcomes. 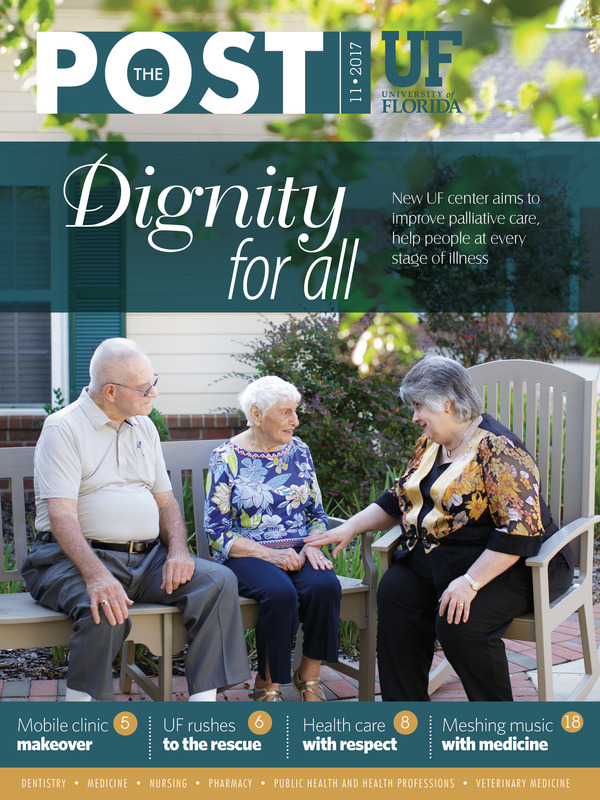 “Spiritual care plays a large part in people’s therapy and how they respond,” said Keri Merchant, administrator for UF Health’s Palliative Care Program, which is working with Wilkie on the project. Soon, Wilkie’s team will begin collaborating with researchers in Turkey to expand her research on an internet-pain assessment tool. The tool allows cancer patients to rate their pain using an online self-assessment tool on a tablet. The information is then provided to nurses and doctors to help them better treat the patient’s pain. Through the expertise of Miriam Ezenwa, Ph.D., R.N., the center is also working to shed light on sickle cell disease, an often-overlooked condition, and the children and adults who live with it every day. About 100,000 people in the United States have sickle cell disease, which predominantly affects African-Americans. Compared with other rare disorders, such as cystic fibrosis, sickle cell disease is less studied by researchers and often less understood by health care providers. A 2009 article in the journal Pediatrics showed patients with sickle cell disease often have less access to comprehensive, multidisciplinary care than those who have hemophilia or cystic fibrosis. Sickle cell disease is much less rare in Nigeria, where Ezenwa grew up. When she was a child, one of her neighbors who had the disease passed away during a pain crisis. After becoming interested in researching health disparities while in nursing school, she delved deeper into studying sickle cell disease to honor his memory. “I thought maybe this is what I can do for him and for people like him, I can help people here and help people in my home country,” said Ezenwa, an associate professor of nursing and former NIH Sickle Cell Scholar. With Wilkie, Ezenwa is leading two studies examining relaxation therapy as a way to help patients manage sickle cell pain, both while admitted in the hospital and as outpatients. She’s also working on a study comparing the pain experiences of African-American patients with cancer and those with sickle cell disease. “We know people with cancer receive lots of empathy, but no one talks about sickle cell disease,” she said. “People with sickle cell disease have pain all their lives. Laurie Duckworth, Ph.D., ARNP, the UF Health Shands director of clinical research and an associate professor of nursing, is also working to help improve care for sickle cell disease, specifically for children and adolescents transitioning into adult care. Duckworth and her colleagues are working to improve ways to screen children with sickle cell for asthma. Kids with both conditions are more likely to die of acute chest syndrome and often experience more acute pain. One goal of hers, she said, is to coordinate the pulmonology screenings into the checkup with the patient’s hematologist. Duckworth and her colleagues also are working on a grant for an app to help children with sickle cell disease and asthma track their symptoms. Their goal is to have this information sent to a nurse navigator who can monitor them closely and pinpoint when someone’s breathing is troublesome. One way the center is helping researchers collaborate and come up with innovative projects is by bringing together everyone on Fridays to discuss studies being developed, Duckworth said. Duckworth, who has a dual role with the college and UF Health Shands Hospital, often helps her research colleagues find partners in the hospital to help recruit patients for studies. Over the summer, nursing students Lucy Schneider and Caitlin Lach visited UF Health Shands Hospital every week with a bag of shawls, each one knit by hand, to comfort a patient. By the end of the summer, they’d given 80 shawls to patients and their families receiving care from the UF Health Shands Palliative Care Program. But they received so much more in return, say the students, who are part of the college’s Comfort Shawl Project. Toni Glover, Ph.D., GNP-BC, ACHPN, an assistant professor of nursing, started the project in 2014 after reading about a similar program. A researcher focused on aging, pain and palliative care, Glover was interested in creating more ways for students to experience working with patients receiving palliative care. Since its inception, the Comfort Shawl Project has given a small group of students an immersive view into palliative care each year. The students partner closely with UF Health’s Palliative Care Team, taking part in daily meetings, where the team helps select patients to receive the shawls. The students then meet with the patients and help them pick out a shawl, which are all unique. About 100 volunteers throughout the community knit the shawls provided to patients, Glover said. “Sometimes nursing education is so much about skills, we don’t focus on how important it is to make a therapeutic alliance with patients,” Glover said. Schneider remembers walking into a room where the patient was unresponsive, but the family was there. She and Lach explained to the family who they were and offered to let them pick out a shawl for their loved one. Glover and her team are studying what students learn from the experience and she hopes to eventually find ways to create opportunities for more students to get similar experiences. Last year Glover and Jeannie P. Cimiotti, Ph.D., R.N., FAAN, an associate professor of nursing and the Dorothy M. Smith Endowed Chair and director of the Florida Blue Center for Health Care Quality, led a course for UF Honors students about end-of-life, advance care planning and the differences between palliative and hospice care. The course was popular and they ended up with almost twice as many students as planned. When Wilkie imagines what things will be like five years from now, she sees an endowed center, named for someone committed to improving care for people and animals with serious illness and their caregivers. She hopes the number of principal investigators working on funded research will be multiplied, too. For today, her goals are to tackle projects that can help move palliative care knowledge into practice immediately. She’s looking for funding to help update a toolkit developed in concert with the Robert Wood Johnson Foundation. The toolkit, which simply needs a technology upgrade, is designed to help educators and learners get all the information they need about palliative care and end-of-life issues. In addition to developing new ways to better care for patients with serious illness and training the next generation of providers, Wilkie hopes the center can help make inroads on changing how we talk about death, dying and palliative care, too. But mostly, her goals for the center all come back to one thing: helping people get the care they need. No one should live in pain, she said.